If you are looking for a way to get outdoors and spend some time with family and friends, Saguaro National Park is a great place to visit. This national park located in Tucson, Arizona, is cared for and run by the U.S. National Parks Service, and is home to the nation’s largest cacti. From viewing the world’s largest cacti to enjoying a short hike with breathtaking views, Saguaro National Park is a great way to spend a day. Saguaro National Parks rich history can be viewed throughout the park. From viewing petroglyphs and painted pictures created by the Hohokam people, to learning more about some of our country’s original homesteaders. Hohokam Culture – Petroglyphs are thought to be a way that the Hohokam culture may have communicated with each other. These petroglyphs can be easily viewed on the Signal Hill Trail. The hill areas allow visitors to view dozens of petroglyphs that are well over 800 years old. Homesteaders – Many of the areas original homesteaders staked their claim and created their lives on what is now the Saguaro National Park. You can view one of these homesteads in the park, viewing the remains of the original adobe house that once stood strong on 600 acres.Visitors can get a feel of what it was like to start a new life in Tucson. Although Saguaro boasts the biggest Cacti in the country, it is also home to many different landscapes and many different plant species. Whilst you explore the vast area keep a look out for these plant species. 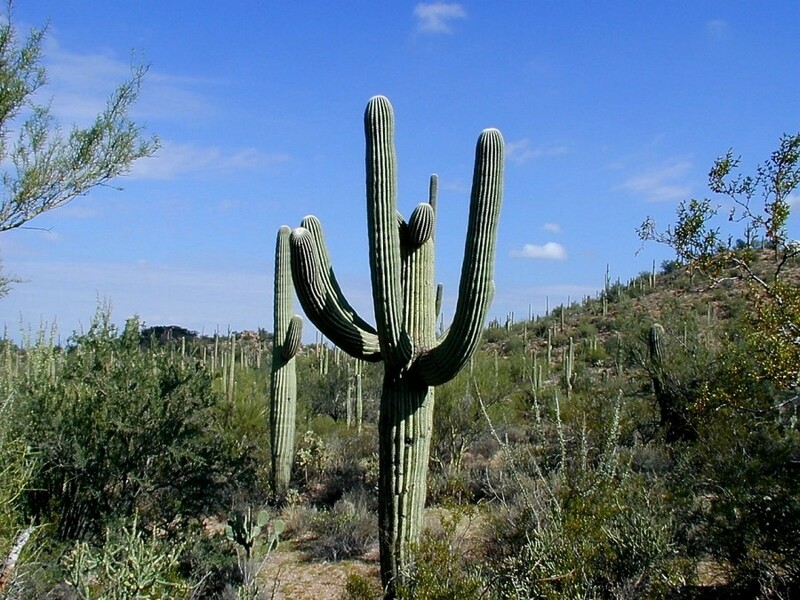 Saguaro Cactus – The Saguaro National Park has two districts that were both formed to protect its namesake, the Saguaro Cactus. Thurber’s Desert Honeysuckle – This plant can be seen covered in brick red tubular flowers throughout spring and Summer. Burrobush – A rounded shrub that has stiff branches and produces short stiff hairs, flowers are spiky and yellow in color. Coyote Gourd – This ground cover can be seen throughout the park and turns into a blanket of golden flowers in May – August. Pine Forests – You may not think that a park that is known for its cacti would have much greenery, however the Rincon Mountain District includes a vast area of pine forest and other greenery. There is much to see and do in the park and each separate Mountain District gives visitors a distinctly different experience. If you are visiting the Tucson Mountain District, you may want to take a short hike, enjoy a picnic at one of the five designated picnic areas, or join in on the orientation program. This orientation program allows you to see a Native American perspective on the Saguaro cactus. You can catch the program daily at the Red Hills Visitor Center. If you are visiting the Rincon Mountain District you can take a bike or car tour allowing you to catch views of the beautiful Rincon Mountains. If you are interested in viewing the old homestead, a one mile loop hike will guide you through home steading in the desert. There are plenty of hiking trails and paths found along the Cactus Forest Loop. A Saguaro National Park Weekly Pass is $10, and this covers one vehicle, an individual pass is $5. You can pay the fee at the entrance or purchase a pass in advance online. Whether you take in just one district, or you decide to explore both, there is plenty to see and do for the whole family when you visit the Saguaro National Park.